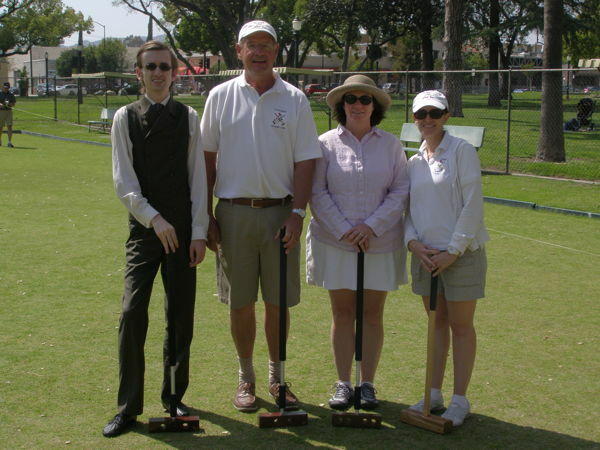 On Sunday May 7th The Pasadena Croquet Club were finally able to play the OO3, i.e., the third annual Ornery Ostrich 9W Doubles tournament. The event was first scheduled to be played in mid-March, but we were rained out twice. The weather today was great, so we were able to play under morning fog but brilliant sunshine in the afternoon. This year the event was moved from Garfield Park to our club court in Central Park. The advantage of playing on a more level and manicured grass was traded off with narrow 4 inch gapped wickets and a full size regulation court measuring 100 feet long by 50 feet wide. The Top Dogz (Scott Rasmussen/Kim Lum). Missing this year were the Bond Girls (Carson Bond and Laurie Mitchell), who were unable to play this year, although they played in the first two events. After the round robin matches were played, the finals re-matched the Super Team against the Gal Pals. Last year’s final was very close, and this year’s was the same. The turning point was a very loose three-ball break run by Constantine which put his team up by a handful of wickets. In their final turn, the Gal Pals were down by only one wicket, but were unable to score a very long and difficult wicket at three-back. This year’s champions are the Super Team, comprised of Michael Rumbin and Constantine Evans. Incidentally, Constantine won this event in its inaugural year. Congrats to the Super Team! Thanks to everyone for playing. Due to the low turn-out of doubles teams, we may play a singles event next year. Stay tuned.